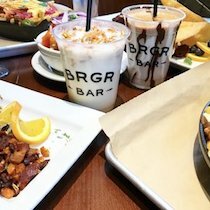 THE INSIDE SKINNY ON… Brunching and Happy Houring at BRGR BAR! 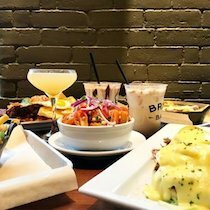 Not only does BRGR Bar offer Saturday AND Sunday brunch every weekend from 11:00 – 2:00, but new menu items have been introduced that we’ve fallen head over heels for. 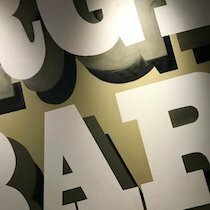 Plus, the new and improved happy hour menu is all the rage in our books! 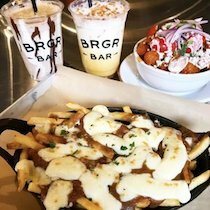 GOOD MORNING VIETNAM – This party starts with BRGR Bar’s “to-die-for” house fries and is layered with pulled pork, sriracha, pickled daikon and carrot, jalapeno, cilantro, gouchjang aioli, sesame seeds… If that doesn’t get your taste buds jumping for joy, we’re not sure what does! 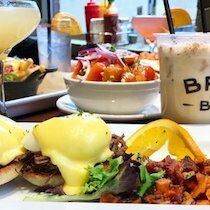 THE BRGR BENNY – Get this: root beer braised short rib. Helloooo flavor! 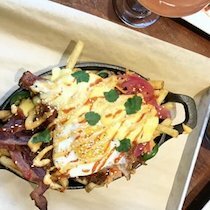 HUEVOS ANCHOROS – This dish had us at the avocado, cilantro, and sriracha trio. 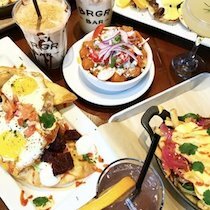 When topped upon fried flour tortillas, beet and black bean crumble, and two sunny side fried eggs, we were in HEAVEN! NUTELLA STACK – A triple stack of pancakes layered with nutella, whipped cream & bananas — oh my lanta! 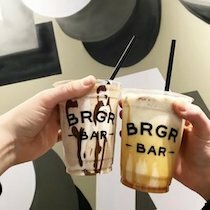 Last week, we scooted north to BRGR Bar’s Portland, Maine location where we were welcomed by a friendly team and the same incredible food we always find in Portsmouth. 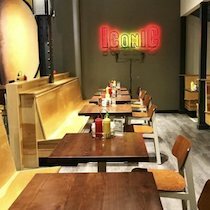 Located near Maine College of Art, the atmosphere here draws a funky vibe that caters to its artistic neighborhood. 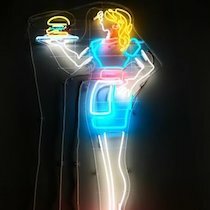 We loved the murals by artist Ryan Writes on Things and light art by Neon Dave. 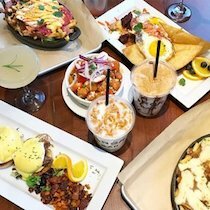 While in Portland, we enjoyed happy hour that also happens here in Portsmouth every Monday through Friday from 3:00 – 6:00! 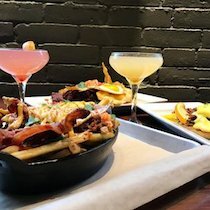 POUTINE – house fries, local Maine cheese curds, and house made gravy… a true feast for both the eyes and taste buds! 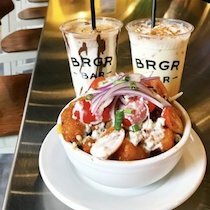 BUFFALO TOTS – Crisp tater tots topped with blue cheese, red onion, scallions, tomato & bacon… our mouths were on fire with flavor. 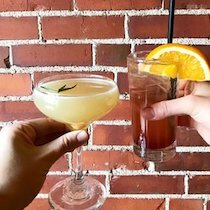 THE SMOKEY PEAR – House infused pear tequila, pear puree, with rosemary & honey simple syrup & lime. 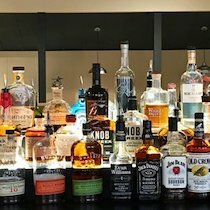 Tastes like coziness in a glass! 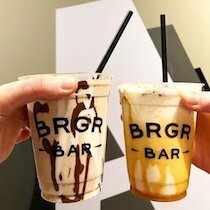 What really steals the show during happy hour are BRGR Bar’s famous milkshakes — adult ($8) and non-adult ($6) — just too hard to resist! 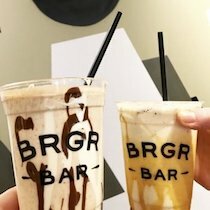 Sea Salt, Caramel & Pretzel; Nutella, Marshmallow & Graham Cracker; and “The Oreo Lift”. 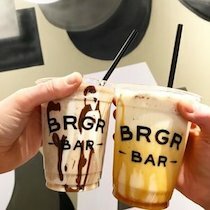 Do you have a favorite item on BRGR Bar’s menu?? Let us know; we’d love to hear!